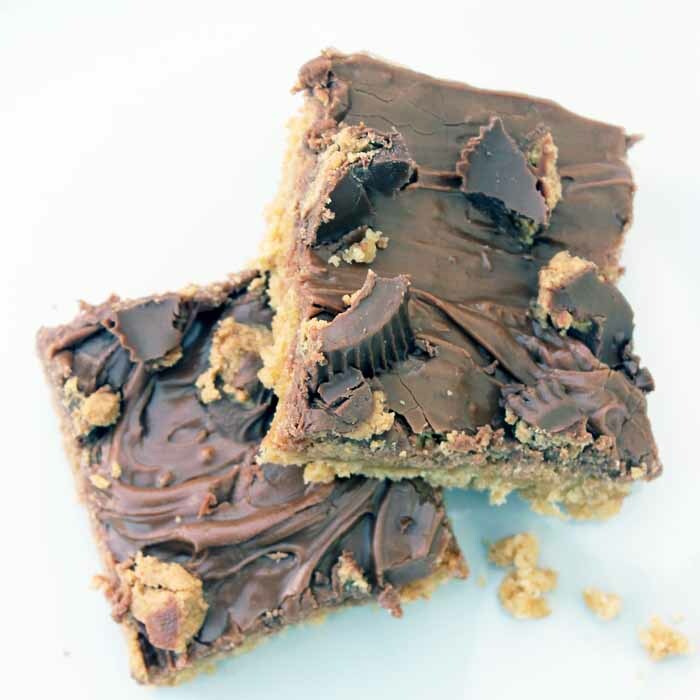 My Reese’s peanut butter cup bars recipe is sure to please everyone in your family. Who can resist the temptation of chocolate and peanut butter together? I know I can’t. Make these bars tonight and dive right into them! They are also the perfect way to use up leftover candy from the holidays! Preheat oven to 325 degrees. Combine eggs, sugars, peanut butter, butter, and vanilla until fluffy. In a separate bowl, combine flour, baking powder, and salt. Then add flour mixture to peanut butter mixture and stir just until combined. Spread into a lightly greased 9 x 13 pan then bake for 25 minutes. Remove and allow to cool. Combine powdered sugar, butter, vanilla, and cocoa until well blended. Then add milk a few drops at a time until frosting is a spreadable consistency. Add more powdered sugar if your frosting gets too runny. Then spread frosting over cooled peanut butter bars. Crumble Reese’s peanut butter cups all over the top of the pan. All that is left is to cut and serve! Dive into these delectable bars anytime of the day! They are perfect for after school snacks or you can also serve them as a dessert after any meal. 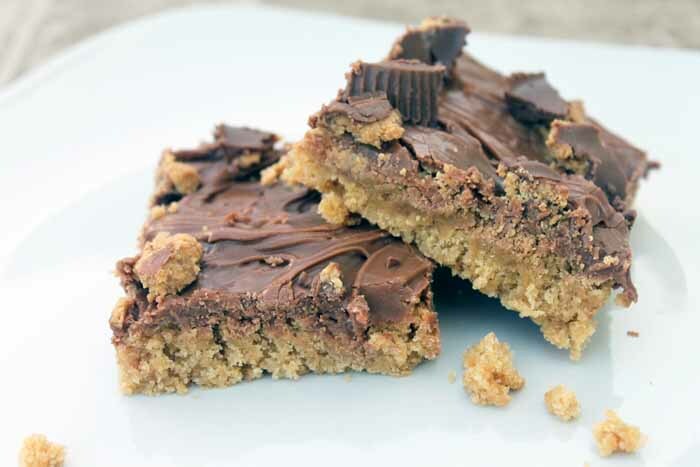 If you love the chocolate, peanut butter combo, you definitely want to give these Reese’s Peanut Butter cup bars a try! So do you need to print the recipe? Try the recipe card below! You will also need an 8 pack of Reese's peanut butter cups. Preheat oven to 325 degrees. Combine eggs, sugars, peanut butter, butter, and vanilla until fluffy. In a separate bowl, combine flour, baking powder, and salt. Add flour mixture to peanut butter mixture and stir just until combined. Spread into a lightly greased 9 x 13 pan. Bake for 25 minutes. Remove and allow to cool. Combine powdered sugar, butter, vanilla, and cocoa until well blended. Add milk a few drops at a time until frosting is a spreadable consistency. Add more powdered sugar if your frosting gets too runny. 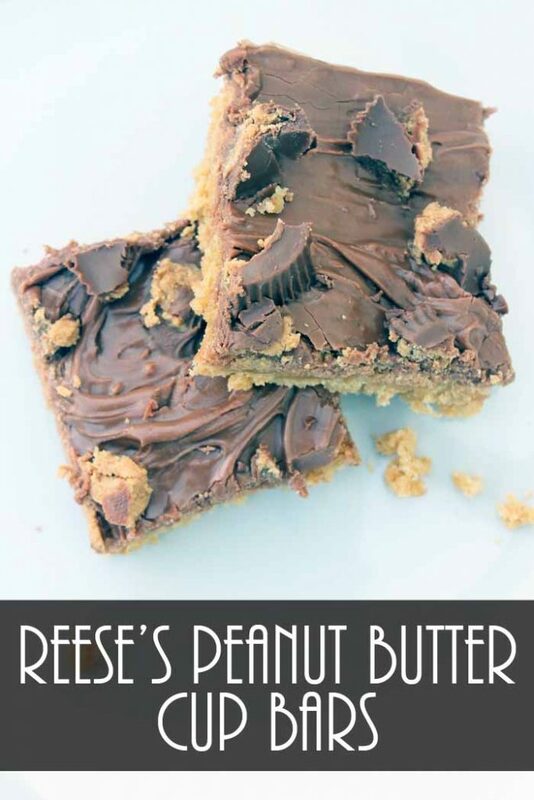 Spread frosting over cooled peanut butter bars. Crumble Reese's peanut butter cups all over the top of the pan. Cut and serve! Oh so good! My Reese’s peanut butter cup bars recipe is sure to be a hit with your family or holiday guests! So do you love this and want more ideas? Try the recipes below!